Prodigy is on Netflix now. Read our review. 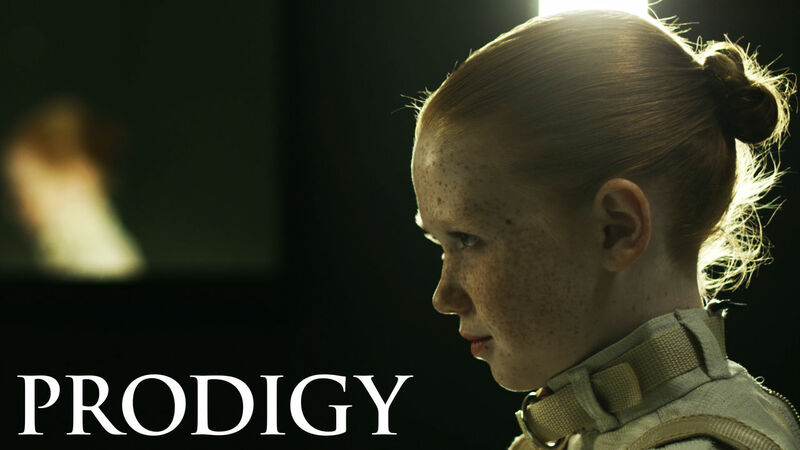 Prodigy is an impressive indie sci-fi thriller that has a gritty, old school ‘80s feel to it, combining elements of Silence of the Lambs, Girl With All the Gifts, and telekinesis movies such as Carrie, Firestarter, and Stalker into a gripping cinematic version of a stage play. While this may sound uneventful to some viewers, co-creators Alex Haughey and Brian Vidal manage to present a compelling and thoughtful story with exceptional dialogue. With powerful performances from Richard Neil and Savannah Liles, fine camerawork and cinematography, and some interesting action and special effects scenes, Prodigy is sure to keep you hooked for its entire journey. Dr. James Fonda (Richard Neil) is a psychologist who is brought in on a secret government project, the last ditch attempt at evaluating a young girl in a straightjacket (Ellie, Savannah Liles) with telekinetic powers. He must match wits with the extremely intelligent girl, unaware of her immense powers or that her life hangs in the balance. The film is basically a stage play brought to the screen, with the primary focus being the interactions between the two main characters Dr. Fonda and Ellie. 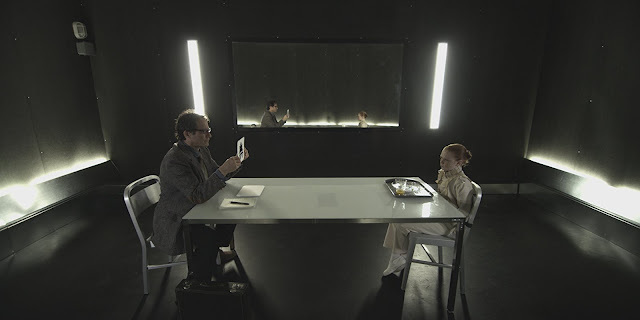 Their encounters throughout the whole movie take place in one interrogation room, with only four locations used in total: the interrogation room, the control room, a hallway, and a park that is used in the epilogue and prologue. The challenge with a production like this one, with minimal locations and a small number of actors, is keeping the audience interested and engaged. Haughey and Vidal do a great job of doing just that, with sharp dialogue and a consistent increase in the pressure and tension. While it may seem a little too similar to a sci-fi version of Hannibal Lecter, it’s different enough to still work. The direction from first-time feature directors Haughey and Vidal is excellent. This is an obvious labor of love that they have been working on for several years, and it shows in the performances that they get from their actors. It also shows in the overall look and cinematography of the movie, doing just enough to keep the picture visually interesting. One particularly strong visual scene involved a chess game between Fonda and Ellie, which had a camera angle placed on the eye level of the chess board. The special effects sequences are all handled well for an indie production and never come off as being hokie or unbelievable. The acting is terrific across the board, but it’s Richard Neil and Savannah Liles that drive the movie. There are several other actors that serve as minor characters in the military compound, with Aral Gribble providing a little bit of comedic relief. It’s hard to imagine anyone else but Neil and Liles portraying Dr. Fonda or Ellie, they not only have a magnificent rapport together onscreen but also deliver outstanding individual performances. Neil has the right look and voice to play the unassuming and empathetic doctor, who has suffered a past lost and is searching for some type of healing by helping troubled kids. You would think that Liles is a true acting veteran, despite being nine-years-old at the time of filming. Her character is smart beyond her age, rough and cold, and dark and potentially very dangerous. At a brisk 80 minutes, Prodigy is a well paced sci-fi thriller that should keep audiences engaged and interested right to the end. With a strong story, great dialogue, and superb performances from Neil and Liles, this is one that sci-fi fans should definitely give a shot.